Bridget Christina Burns was born in Sunbury Victoria 1859 and brought up in Echuca which is two and a half hours north of Melbourne on the Murray River, bordering NSW. Her parents were Bryan (Bernard) Burns and Mary Canavan both from Tuam, in Co Galway, Ireland. Bryan’s name was Anglicized as Bernard. Mary Burns nee Canavan’s father was Patrick Canavan and her mother was Bridget Connor. Bryan and Mary were married in Kilrahan near Tuam in Co Galway when she was aged 20. They came out from Ireland in 1857 on the Ebba Brahe from Liverpool England. With Bryan, aged 29, came Mary his wife, aged 24, and their two children, Margaret aged 3 and John an infant. None could read or write. Bryan was to be employed for two months with a Mr A Nicholson of Upper Plenty, on the outskirts of Melbourne. Wages of 65 pounds. This photo to the left may be of Bryan Burns. Perhaps he is wearing his railway blazer. If anyone recognizes this man I’d love to hear from you. This photo was taken by Alfred Wren in Echuca some time between 1870 when Wren was in Melbourne and 1879 when Wren died in Echuca. If this is Bryan he would have been between 39 and 48 years old. “If you follow the time-line of the history of the railways in Victoria it co-incides with Bernard’s employment with the railways from 1859 through to the time of his death in 1881. In 1859 the railway from Melbourne to Sunbury was opened, this was when the family was living in Sunbury their daughter Bridget Christina Burns was born there in 1859. In 1862 the Melbourne to Bendigo railway line officially opened at Castlemaine, the family was living at Campbell’s creek near Castlemaine at this time. Michael Andrew Burns was born there in 1862. In early 1863 tenders were called for the construction of the railway line from Bendigo to Echuca, the work began in late 1863. The family was then living in Porcupine near Maldon. Mary Jane Amelia Burns was born in 1864 at Porcupine. The railway line from Bendigo to Echuca opened in late 1864. The family possibly moved to Echuca around this time. In 1866 Thomas Burns was born in Echuca. 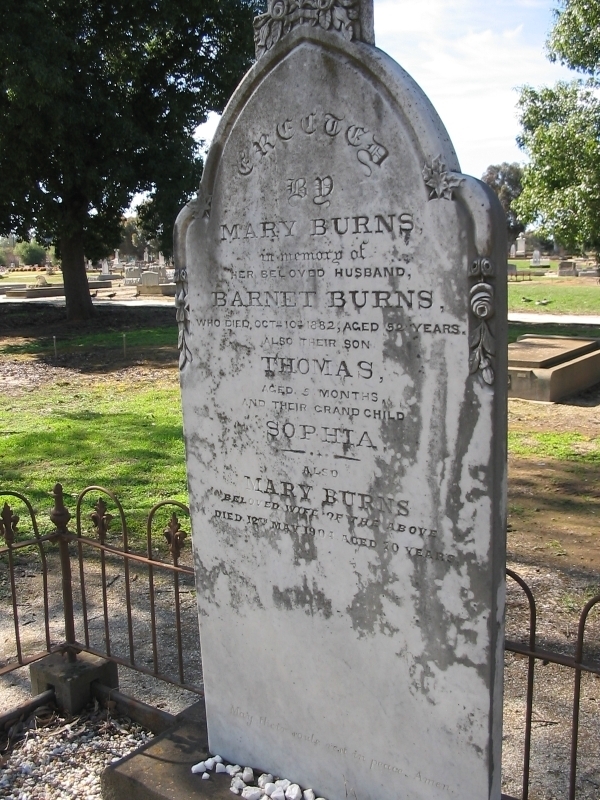 Bridget’s parents Bryan (or Bernard) Burns and Mary Burns nee Canavan are buried in Moama Cemetery, near Echuca in Victoria. Bridget, aged 23, was married to Thomas Mackey, aged 29, on May 1, 1882 at St Mary’s Catholic Church in Echuca, Victoria. Bridget and Thomas had nine children: Thomas born 1883, Eileen “Sis” born 1884, Victor 1886, Mary 1888, Ida, my grandmother,1890, Edmond 1893, Christopher 1894, Alfred 1896 and Doris 1899. Ida Mackey married Francis Collins Fanning in 1915.Most of their married life they lived at 102 McPherson St Essendon. Bridget Mackey was affectionately called “Ma”. On her wedding certificate her occupation is a dressmaker and on her daughter Ida’sdeath certificate she is listed as a Department Store employee. I have been told that my mother was very fond of her and that Ma approved of my parent’s marriage wheras my grandmother was opposed to their marriage on the grounds that my mother’s mother, Grace Collier, was a divorcee. In 1891 Bridget Mackey signed the Women’s Suffrage Petition (as Mrs Mackey) and was living in McPherson St Essendon. Women went door to door to collect 30,000 signatures in favour of granting women the vote. 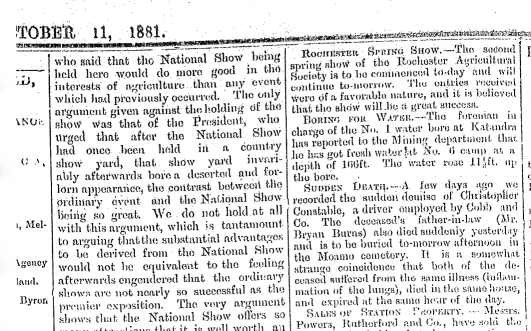 It was presented to the Parliament of Victoria. The vote for women was granted in 1908. Bridget Mackey and Annie Meehan (nee Collins) were the only women in my family who signed this petition. Bridget Mackey nee Burns died at Glenroy on December 18, 1944, aged 86. 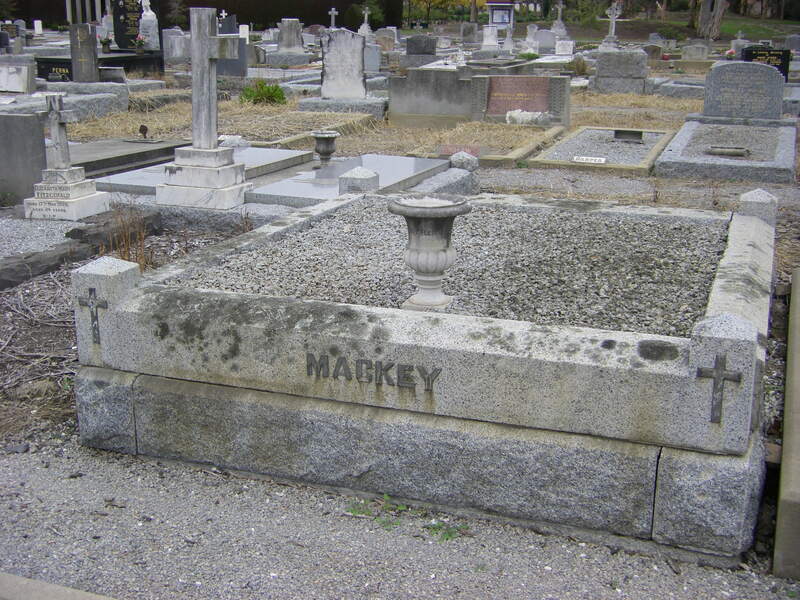 She is buried here with her husband Thomas Mackey who died on the first of June, 1926, aged 73. Bridget Mackey nee Burns, Ida Fanning nee Mackey and Eileen Mackey, Bridget’s granddaughter. This photo includes John Thomas Burns the brother of Bridget Mackey nee Burns and some of his sons. John Thomas Burns died in 1933 so it hasto have been taken before then. The following detailed genealogy reports trace the ancestors and descendants of Bridget Christina Mackey nee Burns from Ireland to Victoria Australia. Please remove living persons on the Burns page as well as per previous message of the Mackey family. Also note the pic of Bernard Burns is my Mothers, I emailed it to Theresa to see if any of the family may know who he is. You seem to have a number of items from my tree on ancestry? Penny I have removed the living people on the Burns page. The photo of Bryan Burns was sent to me by Teresa and I put it on my site in hopes that someone might recognise it. I can easily take it off, let me know. I have looked at your tree on ancestry and it is very detailed. Some of the early Irish birth and marriage info I may have incorporated. I’m not sure which items on my site are from your tree? Again let me know. You have a number of photos which I actually sent to Teresa and you must have got them from her. These were photos from my grandmother’s wedding: Bridget Mackey, Ida Mackey, Eileen Mackey and Mary Mackey and the Fanning brothers. We are second cousins, by the way, sharing Thomas Mackey and Bryan Burns as great grandfathers and Bridget Mackey and Mary Canavan as great grandmothers. Hi there my name is Andrew Hubbard and I am related to Victor Gerald Burns who is my Grandfather. I would love to share some information regarding the family history. My name is Chuck Real. The Reals of Old Pallas (Pallas Graen) are my relatives. William Real who married Catherine Mackey would be related to me. I have been to Pallas Graen a number of times. I live in Omaha NE. Thanks Chuck for commenting. Next trip to Ireland I’d like to visit Pallas Grean, the Mackey and Real home townlands. Kathleen, we think we have your Reals tracked down. I work with an Irish “armature genealogist” from the Pallas area. He has done considerable research on the Real family records of the area. If interested, please contact me at creal@cox.net. Thanks Chuck. I’m interested in any Real Mackey connections. I’ll contact you. I have some Fanning relations at Shanbally Littleton but so far I haven’t made any connections with the Moycarky Fannings. DNA tests do however have us related to Moycarky Fannings but a long way back.